I'll be writing a lot about car camping this summer and many will think we've "sold out" with the purchase of our new trailer but I promise not to neglect our original first love - getting kids into the backcountry! We have some exciting backcountry trips lined up this summer that will see us travelling into beautiful Banff and Kananaskis with our son and friends. I mentioned two of the trips in my recent Camping Project story and described how we plan to bike and canoe into a couple of great backcountry campgrounds in Kananaskis this summer. What I didn't write about however is our first trip into the backcountry planned for next month - an awesome journey into the wilderness of Banff National Park, and a journey that any family could tackle! We will be taking our son on his first bikepacking trip next month to the remote Sundance Lodge run by Holiday on Horseback. This is not the Sundance Lodges in K.Country where you can sleep in tipis or trapper's tents This is the decadent backcountry lodge in the front ranges of Banff National Park accessed by the Brewster Creek Trail off the road to Sunshine Village. It's a gentle 10km hike or ride on a wide well used horse trail. My local source for riding, the Bike Pirate website, warns that the trail can be extremely muddy in spring and rates the trail as intermediate which scares me a little, I won't lie. However, our son will be on his trusty balance bike which means in the worst case scenario, we all hike and carry the little 6lb bike. We are also contemplating bringing the Chariot carrier with us because 10km could be a long distance for a 4 year old and the trail does go slowly uphill most of the way to Sundance Lodge. Either way, we will make it to the lodge and it will be a family trip to remember forever! Hopefully the Brewster Creek Trail will be nice and dry for our hike/ride in. What can families expect at Sundance Lodge? Down home country cooking that any child will eat! I'm talking about fried chicken, lasagne, pancakes, and sausages. There's nothing too fancy or gourmet at this lodge so you don't need to pack your stash of peanut butter with you for junior. Unparalleled service and hospitality! I dare you to find better at a backcountry lodge. Who can stay at Sundance Lodge? Families with children between the ages of 4-6 are welcome to stay at the lodge in the months of May and June as well as in late September through October. While this may seem restrictive, these are the months when you most want to be sleeping inside and not in a tent. These are the months with possible rain, frost, snow, and early/late season cold spells. There's no place I'd rather be than in a warm cozy backcountry lodge! Special youth hiking rates would apply to small children staying at the lodge. Families with children over the age of 6 are welcome at the lodge any time. 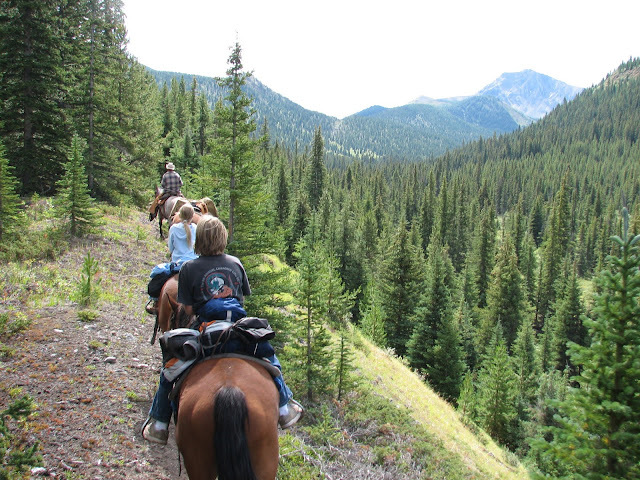 You can ride to the lodge on horseback - after all, it is run by Holiday on Horseback! The youngest horseback riders we can accommodate on the overnight trips is 9 years old. If they have riding experience, we could accommodate 8 years old. For the hourly rides, we can accommodate as young as 6 years old. For more information on the lodge including prices, dates, and availability, please visit the Holiday on Horseback website. I will write up a complete trip report after we've finished our journey to Sundance Lodge but in the meantime, check out some of my previous stories that I've written on the Lodge. Holiday on Horseback also offers a variety of backcountry horseback trips, trail rides, and carriage rides. Visit their website to see how maybe you could treat your family to something special this summer. Disclaimer: Our trip to Sundance Lodge has graciously been sponsored by Holiday on Horseback. As always though, all thoughts and opinions are my own and I was not compensated beyond lodging for this story.